The first pic is the most recent finish to the Red Thread series for me…4 months down, 8 to go. I officially said that I would do 1 per month, so I have until Dec to do the rest, however I obviously have some catching up to do! As promised here is the picture of my next start, Sailing Home by Blackbird Designs. I am going to stitch this on 36ct. Vintage Maritime White by Lakeside Linens and I will be using DMC threads, rather than overdyeds. I have changed the colors to match the blues in Jack’s room. 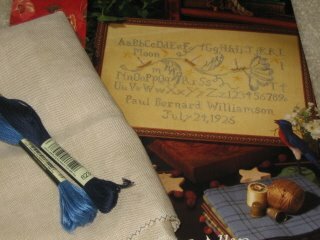 As of now…the lighter blue (322) will be all of the sampler letters, as well as the giant flower in the middle and the birthdate at the bottom. I am planning on using the navy blue (823) to stitch the ships and to do the name at the bottom. I haven’t figured out how to translate those ships into 1 color yet, but that will come to me as the project comes along I’m starting it today, as I’d love to get a good portion of it stitched before I go back to work on the 14th!